One of my clients was telling me about a friend of hers. Well not so much a friend, but just another dentist that she knows. So my client’s friend has a big big multi-dentist multi-staff office. And headaches like you would not believe. She takes every insurance she can, yet she has never analysed which insurances are costing her money, and which insurances are costing her time. She appears to have no idea about much. Except that she feels that she needs to just keep working the office at a hundred miles an hour. The oats is not the answer. It’s the training, and the type of training. My client’s friend has lost touch with reality. She’s failing to see the forest for the trees. Maybe she’s created an illusion of grandeur for herself that she now has to live up to? Maybe she feels that her friends, her colleagues and her family now expect her to have this big big dental practice? I knew a dentist here in Australia with a similar issue. He also was running a not so profitable office. His associate dentists were screaming out for more patients for their books, but at the same time they were telling the owner dentist that the fees of the office were too high. So the principal dentist pumped more new patients toward those noisy associates. And he dropped his dental fees. Despite the fact that the New Patient value for those dentists was considerably lower than for New Patients seen by the Principal. And the nightmare just continued on. Even with lower fees and more new patients, the spoon fed associates did not have the skills to diagnose correctly, treatment plan correctly, present correctly and create urgency and concern for their patients. Patients don’t know what they don’t hear and they don’t understand. And they don’t own it. My principal dentist in this case can diagnose present and close. And would not bother to learn. More employees can often mean more headaches. The Pareto principle can apply to staff as well as to patients. Sadly in both these instances, the owners would be better if they downsized, and streamlined. They’d look smaller, but their bottom lines would be better. Sometimes dentists confuse activity with accomplishment. There is no point in being busy and losing money. There is always an opportunity to draw stumps, regroup, and start over. There’s zero point in providing charitable employment to people costing you money. When I present treatment to my patients I always present it as diagnosed, without ever assuming whether the patient will want the treatment, accept the treatment, or be able to pay for the treatment. Because I can’t tell from the outside what’s going on on the inside… of the patient. I’m not a mind reader or a fortuneteller. You see I’ve been “reflecting” today. On the outside I look alright. I mean, I don’t look unwell. But who knows what’s going on in me on the inside? This week I’m seeing the hand doctor, the shoulder doctor and the gastroenterologist. And so it has me wondering about a couple of things. Firstly, I’m wondering, if you’re going to be having an endoscopy and a colonoscopy on the same morning do they use the same camera? And which one do they do first? To me that’s an important piece of information to know. More importantly, with all these medical inspections of my body but especially with the gastroenterologist, it raised the point that looking from the outside, nobody really knows what’s going on the inside of you, do they? What would you do if you found out that you were terminally ill? You see, nobody really knows what’s around the corner, do they? And it’s about living those moments, isn’t it? We all remember special moments in our lives, and special events. But do you remember these special events? Do you remember where you were when you heard that John Lennon had been shot? Where were you when you heard about the death of Princess Dianna? And of course more recently, where were you when you found out about the planes hitting the Twin Towers of the World Trade Centre? Life really is about moments. And you never know what’s going on inside someone’s body. Just like you never really know what’s going on inside someone’s head either? Two of my best friends died [separately] in their early sixties after being touched on the shoulder by the Cancer Fairy. One was given four months notice, the other was given less than three weeks. Both had not planned to leave the earth so early. Though one of them had retired earlier to at least enjoy a few years without the daily grind of work. The thing is, death was not on their radars when it came knocking. And we never know what’s going on inside someone’s body, or their head for that matter. So it’s wrong then to make assumptions. When I talk to someone, I always try to find out about them before I begin a conversation with them. Because I can’t tell from the outside what’s going on on the inside. I don’t know whether they value their oral health and will accept treatment? I don’t know whether they want to keep their teeth no matter what or whether their Nan and Pop managed just fine with no teeth for fifty years? And I don’t know whether their teeth are so important to them that they’re happy to pay whatever it takes to keep their teeth in the best possible state that they can? I simply present the facts and help the patient understand what’s best for them. I don’t believe in letting the patient choose an option because that’s called passing the buck. Allowing an uneducated person to decide makes no sense to me. After all, dentistry is a long degree and it’s a lifetime of continuous learning for us, as dentists. How would an uneducated patient lay person really know what’s best for them? If you had a hole in your roof and it was raining cats and dogs outside would you want the roofer to tell you all about your options such as a plastic tarp, or a canvas tarp, and how long they’ll each last, or would you rather he simply tell you what you need and then go ahead and fix it properly first time? Do you want to know about patching? Or do you want your roof fixed properly? If your tyres on your car a worn and bald, do you want your tyre guy to tell you that you might get another few hundred miles on them, or would you rather he let you know about the best tyres he’s got that will keep your children safe when you need to pull up quickly on a wet road? Do you want him to tell you he’s going to “watch” your tyres? Or would you rather he fix them now before they blow out and kill someone? And it was pretty good advice…. What Are You Doing To Reinvent Your Business To Continually Be Adding Value For Your Clients And Patients? You can either win at it, or be beaten at it. And winning is more enjoyable. There are good times when everyone wins, and then there are rough times when everyone loses. When a market is rising, it’s easy. When a market is falling, it’s easy to get swept along into the vortex. And then there are times, when we think the seas are calm, and all of a sudden, we’re overtaken because of our own complacency. And we are all guilty of complacency. Of taking our eye off the ball. In Australia, the Dental landscape is changing. Is it changing where you are? In Australia, an oversupply of local graduates, thanks to a dramatic increase in the number of Dental Schools, coupled with an increase in registration of overseas trained dentists, has now seen the proliferation of new dental practices in many places where they are not needed. Established practices in those areas are now all of a sudden seeing new dental offices spring up in their town literally overnight. And it’s like a wake up call that maybe we need to get back into gear. The proliferation of corporate entities into the cottage industry of dentistry has also seen a realisation that the big boys are here to capture some of our “assumed” turf. When a new restaurant opens up in town, everybody in that town wants to know if that new restaurant serves good food? And your patients will be wondering whether the new dentist in town, be it another small set up or be it a large corporate, is going to give them the same product or better than what you’ve been giving them? You need to keep reinventing yourself. You need to keep finding ways of being better in business today than you were yesterday. When I visited Chick-Fil-A headquarters in Atlanta at the start of the year I was pleasantly surprised when they told me that the day after they launch a new process, a new procedure, a new product, that they are looking out for ways of making that product, process or procedure better the very next day. And it’s this mindset that keeps them as an innovator, as a mover and a shaker in their industry. What are you doing in your business to be a mover and a shaker? What outcomes or results are you improving upon for your guests and patrons? If you’re not trying hard to keep your patients by reinventing yourself and your processes, you can bet there’ll be another dentist come along real quickly who’ll do just that same thing. And in so doing, they’ll cherry pick off of your patient base a select number of patients that you didn’t even know were dissatisfied with you. And along the way they will also be providing a clear and better alternative for those people in your town who may not have even decided whether or not to be your patient… but sure as eggs won’t ever get the opportunity to choose once the new kid on the block rides into town and offers them some flashy alternative? Yeah sure, there will be patients who’ll need the advancements in procedures that you can go away and learn. is an acclamation that most likely will fall on deaf ears most of the time out there in the community. What your patients and prospective patients are going to want to know is are you up with the latest…. in service…? Is your phone always being answered, and answered well? From 6:00am in the morning through to 10:30pm at night? Or does it simply just go through to an answering machine? And hopefully someone might phone them back…some day? Are your patients and prospective patients able to make appointments online? And not just leave a message in a box on your website so that someone maybe get’s back to them? Rather, can they make a real appointment immediately just like Open Table does for dining out? Is your social media social? And are patients and potential patients able to get an immediate response via your Facebook page? Or is that Facebook page just another black hole showing up your inadequacies? Are your potential patients able to receive an initial offer to get them in the door that does NOT offend your existing loyal patients? You just need to know where to find them…. Most times they are obvious to others and not to you. But remember, if it has been done it can be done. The answers are out there…. If you can’t work it out yourself, then don’t let the receding tide drag you under. There is always a solution for those who seek it. Email me david@theUPE.com if you are interested in finding out who my clients are using to SMASH IT OUT OF THE PARK with online appointment scheduling…. 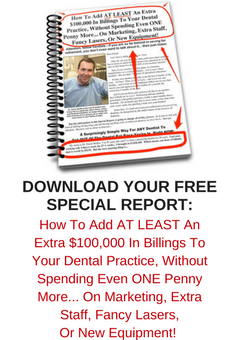 One of the key deficiencies I see in Dental Offices is insufficient resources. And by that I mean primarily not enough staff. Firstly, there are missed opportunities. If you’re thin on the ground then you’re thin on the ground. The ringing phone won’t be answered as often, because the short numbered staff are doing other things. Your valued patients and guests visiting your office will not be greeted as warmly because chances are that your greeter will be off doing other things. It’s not so much that these things are being purposefully *NOT* done, it’s simply that they’ll be selectively omitted just because the stretched team needs to be able to get themselves through the day…. Imagine a soccer team playing with ten men instead of eleven…. sure they can probably get through the game and possibly cover the whole field…. Secondly, we send a subliminal message to our customers and patrons that we are mean and tight and they can just wait. Our customers know when they’re being kept waiting. And they know when they’re being made to wait unnecessarily. How frustrating must it be to a patient to have to wait, with mouth open, while the dental assistant runs and gets the cords that she’s forgotten? It’s the same when the patient is leaving the office…patients have to wait to check out after treatment. The patient has just received several hundreds of dollars worth of treatment, and we don’t have sufficient staff to be on deck to process their departure in a comfortable manner? “I’m just about to hand over several hundred dollars here and yet why on earth are there insufficient team members available to take my payment and to schedule me an appointment? And thirdly, we stretch our staff to breaking point and they end up despising us for overworking them…. How hard can you stretch your team, and for how long? Sure, there are days when we’re thrown into overload because someone on our team is unable to come to work. And on these days, when it is unexpected, it’s remarkable how the team rises to the occasion. But we can’t be making our team perform under those conditions day in and day out, just because they were able to do it well once…. Overstretching our team is like overstretching a rubber band. It could snap, or it could become denatured and lose its efficacy when the pressure is relaxed. Applying gentle pressure on occasions is tolerable. Consistently applying continuous pressure will eventually result in trauma to your team and to your office. The dollar cost of being well staffed is returned several times over in collections. Dental office owners sometimes don’t see this. Staff are not an expense. Investing in sufficient staff pays dividends. Failing to invest in sufficient staff reduces collections and reduces profits. Not much cost at all? And we get all those benefits of having the extra pair of hands all day…. This One Dumb Decision Is Costing You Millions…..
Why do people not take immediate action? It’s not as if we’re curing the common cold. It’s not as if you magically get better, no matter when you begin your medication. The reason that it is not like that is because the end destination is not the same. It’s not as though we’re simply running a length of the oval. Because in life, the goalposts keep on moving. Is it simply that people are stupid? Or are they scared of the unknown? Lesson One. When you start affects where you finish. Here’s what people think happens in business…. Firstly, they believe that the common destination is simply a new level. They believe that the common destination is the same, whether you begin now, next week or next year. If you start your journey a week, a month, a year later, you are worse off, because although you think you end up at the same place, you’ve actually missed out on the opportunity, and income, that you would have gained by arriving there sooner…. But in reality the finish line moves…. Lesson Two. In reality, improvement is not a destination, it’s a journey. Once you learn something you can never unlearn it. You can only ignore it…. Once you learn something new you start your business on a new trajectory, and not on a new level. And so, if you start a week later, a month later a year later, you never reach the same level. And so the delay in beginning creates a permanent cumulative loss or difference. Perpetuated year in and year out…. People think that same is same. But same is not same. If I want to learn golf, I can learn in different ways. I can try and teach myself. Or I could read magazines. Or I could go to a tournament. Or I could buy a golf book. Or I could attend a golf clinic with other students. Or I could have one on one tuition. Or I could have it once. Or I could have one on one tuition weekly for a year. Do you think my choice of golf tuition would affect my outcome? Or would all roads lead to Rome? Would I improve to the same level regardless? I think the answer is obvious…. But if the answer is so obvious in golf lessons, why is it not so obvious in business lessons? Why do people, smart business people, just blunder on regardless with ineffectual methodology attempting to achieve different outcomes? Isn’t it logical, that if there is a better way, then that is the best way to go? Improving your business is like buying real estate…. start as soon as you can. Q. When is the best time to plant an oak tree? Q. When is the second best time to plant an oak tree? Start now…he who hesitates really does lose….